Delicious & smooth. Blended with coconut water. Per 100ml 20kcal 84kJ. Low in fat and calories. With calcium, vitamins B12 & A. Gluten, dairy and soya free. No added sugar - contains naturally occurring sugars. No preservatives or colours. Suitable for vegetarians and vegans. Kosher.Coconut perfection no taste bud can resist. 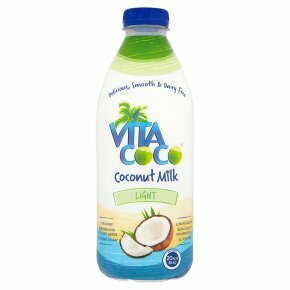 A Lighter Alternative Our light coconut milk has all of same goodness as our original coconut milk, but with less coconut cream for a lighter taste and 50% less fat! Simple and Plant-Based We're nuts about keeping things simple, so when it comes to our coconut milk, we don't mess with that straight-from-the-coconut taste. More of the Good Stuff Other non-dairy milks tend to be a whole lot of water. Ours is packed with coconut water, which makes a deliciously smooth and sweet coconut milk with the added benefit of natural electrolytes. The Perfect Pour Delicious and satisfying with no dairy, soy or funny business. Coffee, tea, cereal, smoothies, straight up - wherever milk goes, we go too!